Located more than 2,300 miles off Chile's coast, remote Easter Island, a UNESCO World Heritage Site, is inhabited by the ancestors of a sophisticated society that developed a millennium ago, and then disappeared, leaving an archaeological legacy of ancient stone villages, open-air sanctuaries and giant statues called Moai. Legend shrouds its mysterious megaliths called Moai, carved by the Rapa Nui people. Why these Moai were created and how they were moved to their present sites--as well as the mythology of the Rapa Nui culture--intrigues historians and anthropologists to this day. Together, these incredible destinations encompass the mystery, power and natural splendor that creates a singular, extraordinary travel experience. Easter Island has captivated the imagination of explorers for centuries. Upon arrival you are escorted to your luxury hotel in the center of this scenic capital city, anchored by the majestic Andes mountain range. This afternoon discover the fascinating architecture, dynamic economy, rich history, and natural beauty of Santiago. Visit beautiful San Cristóbal Hill, a park featuring a monumental sculpture of the Virgin Mary. This morning, fly 2,300 miles west to the most remote inhabited island on Earth — Easter Island. This tiny volcanic triangle, surrounded by the vast Pacific Ocean, is an archaeological treasure of ancient villages, open-air sanctuaries and giant moai. 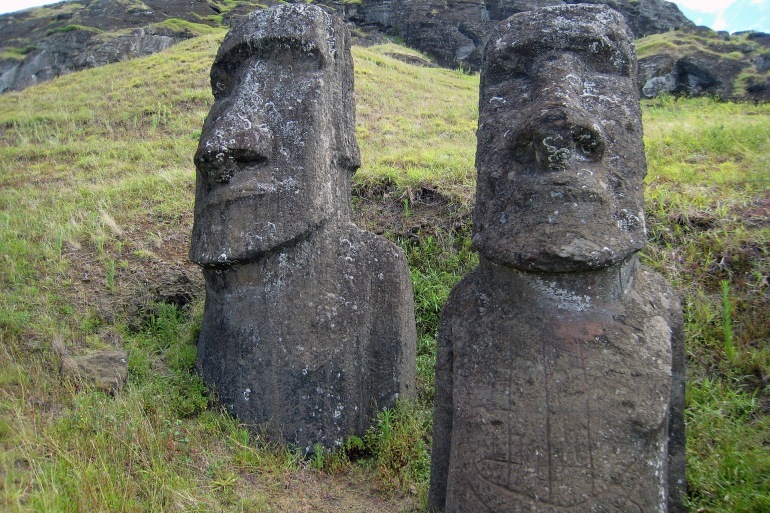 These tall and immensely heavy statues were carved from dense volcanic tuff, then transported for miles to the coast and raised onto great stone altars called ahu.How they were carved and moved remains a mystery. Over the next two days, enjoy small-group exploration with expert guides. Each day choose from a variety of walks and tours ranging from easy to difficult; some concentrating on scenery, others on history and culture. Led by resident archaeologists, you will visit ancient villages, sites and sanctuaries, the volcanic Rano Kau Crater, and get a close-up view of the iconic moai statues. Learn the history and myths behind this UNESCO World Heritage Site, and the captivating story of this island and its people. Enjoy the morning relaxing or exploring the local village of Hangaroa, a community alive with fishermen and surfers. Fly back to Santiago this afternoon. On Day 6, tour the Los Dominicos Craft Center, a renovated convent and cozy labyrinth of more than 150 Chilean artisan shops, antique vendors, cafés and a restored church. You have use of your hotel room until 6pm, at which time you will be transferred to the airport for your flight home or on to your next destination.